I was approached awhile back because some conference organizers were using an abstract submission site that did not have this feature, so how to distribute the submissions was an open question. 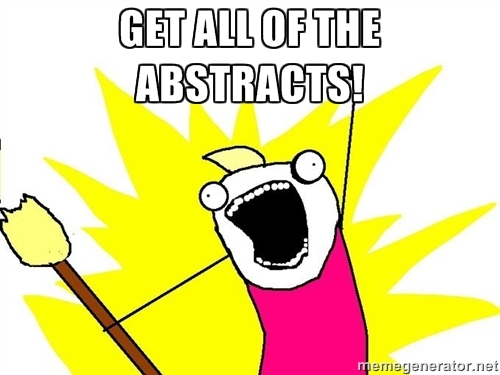 Furthermore, the submission website had a suboptimal interface that forced the organizers to download each individual abstract separately rather than as a whole. As a final annoyance to the organizers, the submission process was one such that researchers could submit their work in a variety of formats, including .doc, .docx, .odt, and .pdf files and the conference organizers did not have a way to automatically analyze each of these file types. Below is the code I wrote to perform steps 1-3. The conference organizers did the text mining and distribution. After the automatic extraction, there were still a tiny number of abstracts that were not converted properly, so this was done by hand. In the end, this saved a massive amount of time and allowed the conference preparation to proceed in an efficient manner. Improvements on this could include creating more modular code, making the authentication process more secure, and creating a function that accepts a file and returns the text from that document. I hope some of this code may be useful in your future tasks! links = links[169:-5:3]     # The first paper link will always be 169. Then go by 3s. print "There is something wrong!" print filename + " is an unrecognized file type!"